More and more we are seeing the online medium being used to deliver teacher training, and the need for effective evaluation strategies for these programs is crucial. This study investigated the impact of instituting a well-structured quality-assurance process for monitoring a large-scale, statewide online professional development model: Florida Online Reading Professional Development (FOR-PD). FOR-PD is Florida's first large-scale online reading professional development project, and has served 37,000 educators since 2003. Findings from the implementation of this situated model suggest that, although implementing an effective system of quality assurance checks (QACs) in an online professional development program can be expensive and time consuming, it can be well worth the effort. Not only can QACs help to reaffirm project goals and keep major roles and responsibilities intact, they also provide a mechanism for measuring and communicating student progress on a broad-to-narrow scale. Other benefits include improved online teaching methods and learning; a significant increase in course-completion rates; and better communications among and between the project's staff, facilitators, and students. Zygouris-Coe, V., Swan, B. & Ireland, J. (2009). Online Learning and Quality Assurance. International Journal on E-Learning, 8 (1), 127-146. Waynesville, NC USA: Association for the Advancement of Computing in Education (AACE). Retrieved April 19, 2019 from https://www.learntechlib.org/primary/p/25228/. Archer, W., Garrison, D. R., Anderson, T., & Rourke, L. (2001). A Framework for Analyzing Critical Thinking in Computer Conferences. Paper presented at EURO-CSCL 2001, Maastricht. Berge, Z.L. Fredericksen, E., Pickett, A., Shea, P., Pelz, W., & Swan, K. (2000). Student satisfaction and perceived learning with on-line courses: Principles and examples from the SUNY Learning Network. Journal of Asynchronous Learning Networks, 4(2), 7-41. Hara, N. & Kling, R. (1999). Students’ frustrations with a web-based distance education course. First Monday, 4(12). [On-line]. Available: http://www.firstmonday.org/issues/issue4_12/hara/Hirumi, A. (2005). In search of quality: An analysis of e-learning guidelines and specifications. The Quarterly Review of Distance Education, 6(4), 309-330. Kanuka, H., & Garrison, D. R. (2004). Cognitive presence in online learning. Journal of Computing in Higher Education, 15(2), 30-49. Kemp, W. (2002). Persistence of adult learners in distance education. The American Journal of Distance Education, 16(2), 65-81. Kim, K.S. & Moore, J.L. (2005). Web-based learning: Factors affecting students’ satisfaction and learning experience. First Monday, 10(11). Kleiman, G. L. (2004, July). Meeting the need for high quality teachers: E-Learning solutions. White paper written for the U.S. Dept. Of Education Secretary’s No Child Left Behind Leadership Summit: Increasing Options through E-Learning, Orlando, FL. [Online]. 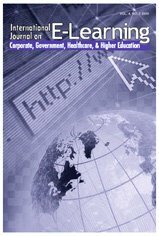 Available: http://www.ed.gov/about/offices/list/os/technology/plan/2004/site/documents/Kleiman-MeetingtheNeed.pdf Moore, J.C. (Ed.) (2002). Elements of quality: The Sloan-C Framework. Needham, MA: Sloan Center for Online Learning. Morris, L.V., Finnegan, C., & Wu, S. (2005). Tracking student behavior, persistence, and achievement in online courses. The Internet and Higher Education, 8(3), 221- 231. Morris, L.V., Wu, S., & Finnegan, C. (2005). Predicting retention in online general education courses. The American Journal of Distance Education, 19(1), 23-36. Palloff, R.M. & Pratt, K. (2005). Online learning communities revisited. Paper presented at the Annual Conference on Distance Learning and Teaching, Madison, Wisconsin. Richardson, J.C. & Swan, K. (2003). Examining social presence in online courses in relation to students’ perceived learning and satisfaction. JALN, 7, 68-88. Rossi, P.H., Freeman, H.E., & Lipsey, M.W. (1999). Evaluation: A systematic approach. Newbury Park, CA: Sage. Rovai, A. (2003). A practical framework for evaluating online distance education programs. The Internet and Higher Education, 6, 109-124. Rovai, A. (2002). Development of an instrument to measure classroom community. The Internet and Higher Education, 5(3), 197- 211.